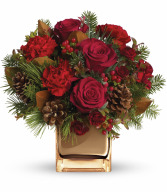 Red fresh flowers in winter greens designed in a stunning dark gold mirrored cube. One sided arrangement great for a desk, coffee table or entry way table. 2018 Thomas Kinkade is here!! 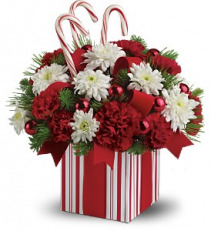 But order early they will not last long! This years container is cute horse drawn wagon in a covered bridge setting. Fresh flowers in reds and whites. 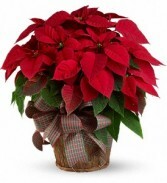 Our poinsettia plants are beautiful!!! 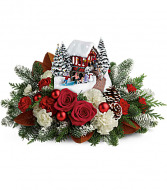 We put decorative ribbon, twigs and birds in them to dress them up. Beautiful fresh centerpiece with winter greens, candles and red fresh flowers. 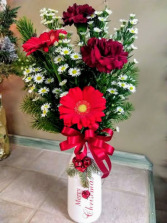 Great for Christmas dinner, gift or party. Old fashioned milk bottle type container designed with fresh winter greens and beautiful fresh flowers. 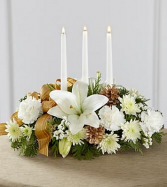 Very pretty whit and gold table centerpiece. Soft and elegant. 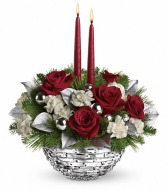 Great for your dinner table or to give for a gift. 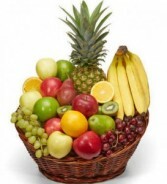 Delicious fruit of all different kinds. 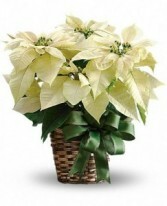 We buy everything fresh and arrange it all in a wicker basket. 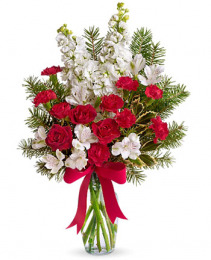 Christmas joy is a traditional arrangement with winter greens and fresh red and white flowers. Cute little penguin hugging a block of ice container. 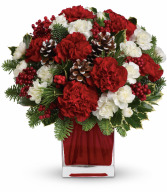 Winter greens and red and white flowers added. 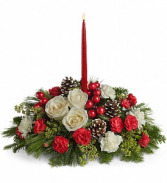 Beautiful traditional centerpiece with mixed winter greens, red and white fresh flowers, berries, pinecones and a candle. 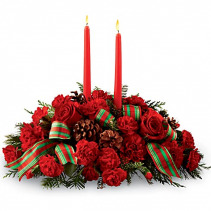 Great gift for a dinner table. 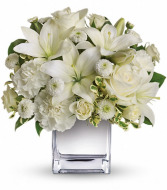 Silver glass cube designed with white fresh flowers. Beautiful elegant arrangement. Cute, cute, cute! Candy canes and mixed winter green with fresh red and white flowers. We added ribbon and balls to top off this adorable arrangement. Beautiful silver glass cube designed with red and white roses and silver accents. 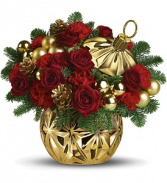 Ceramic container that looks like an ornament designed with red fresh flowers and gold accents. 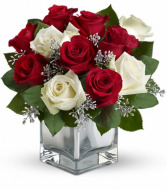 Beautiful mirrored red glass cube designed with mixed winter greens and fresh red and white flowers. 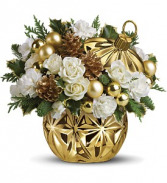 Ceramic container shaped like an ornament designed with white fresh flowers and gold accents. 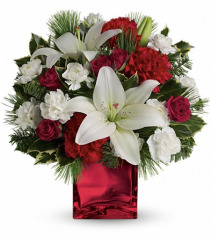 Really pretty arrangement designed with fresh winter greens and red and white fresh flowers. Beautiful glass container that would make for a very nice gift to use year after year. 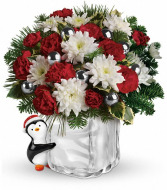 Sparkle of Christmas is designed with winter greens and fresh red and white flower with silver accents. 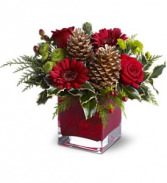 Winter greens and fresh red flowers designed in a glass red cube. So festive! 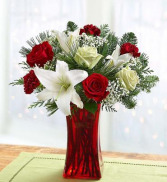 Red glass vase designed with red and white fresh flowers and winter greens. 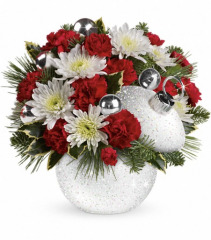 Great ceramic round container that looks like an ornament designed with mixed winter greens and fresh red and white flowers. Beautiful arrangement designed in a glass vase with winter greens and fresh red and white flowers. 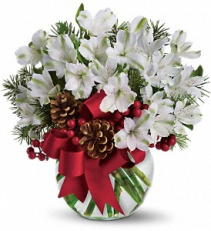 Beautiful white Alstromeria lilies designed in a glass container with a bow, berries and pinecones.